Multichoice Nigeria made a smart move by introducing GoTv,it has enabled millions of Nigerians to have access to affordable and exciting TV shows. GoTv Nigeria is a product subsidiary of South African-based Multi choice Africa, owners of DSTV pay television. 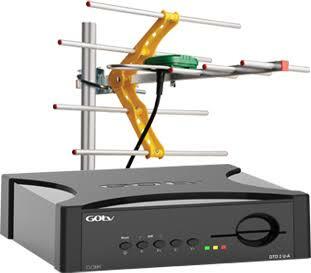 While DSTV is satellite based, GoTv makes use DVB-T2 which is a classified as Digital Terrestial Broadcast Technology. GoTv Bouquet Nigeria are the GoTv Channels, GoTv Stations and GoTv packages that are available to GoTv Nigeria subscribers. A: GoTv is a digital Pay TV service from Multichoice Nigeria,owners of the popular Dstv Television. Q2;Do I need a satellite dish? A: No you don't,as stated earlier,GoTv does not require installation of dish. It uses broadcast method that is similar to what our local stations likes of NTA and AIT use, but with better video and audio quality. Q3; Is GoTv available in all locations and rural areas in Nigeria? A: No,dont make the mistake of purchasing GoTv and taking it to your village or a rural area,it will not work,however GoTv works in Major urban cities in Nigeria,if you want to watch foreign stations in a rural area,try Dstv because it makes use of direct satellite connection. Q4; When was GoTv lunched in Nigeria? A: It was launched into Nigerian market back in 2012. GoTv was first launched in Ibadan Oyo state as GoTv Nigeria offering 20 channels then. Q5; How reliable is GoTv in terms of network connection? GoTv coverage is literally available in all Nigerian Cities and towns in the past years. Though,sometimes you might experience loss in connection but generally it's connection is fair. Q6;How Much is GoTv Decoder in Nigeria? and N13,000 Naira for combo decoder. Q6A: How do I pay for my Gotv subscription? A: You can easily pay for your Gotv subscription by using your mobile phone at home,CLICK HERE to read article,or via any available ATM machine via quickteller or walk into any GoTv office and make payment, make sure your decoder is switched on. Q7: What is inside a standard GoTv decoder box? A: A GoTv decorder box comes with a GOtenna (GoTv antenna), a remote and three month free GoTv plus bouquet. Q8; What are the type GoTv Bouquet available for Nigerian subscribers? Q9: what are the cost of GoTv Bouquet in Nigeria? A: GoTv Plus Package costs N1800 Naira per month and offers 39 general entertainment channels with 7 local. GoTv Value Package which costs N1200 Naira per month and offers 23 general entertainment channels with 7 local. GoTv Lite Package which costs N1050 Naira for three months and offers 12 general entertainment channels with 6 local channels. Q10. What are the channels in GoTv Plus Bouquet? I saw an info on dove tv on my govt that the station will be HD from September 1, and non compliant decoders may not see the channel, will my decoder be affected?